How do you turn good ideas into a business plan? Facebook started with a good idea. So did Google. Toyota had a pretty good idea when it developed a hybrid engine. Good ideas aren’t limited to major companies. The young couple who decides to open a doggy day care in a town where a lot of people commute to work may have a great idea, too. A good business idea meets a real need or desire. It offers something new (or at least a little different). It’s grounded in reality, not wishful thinking. 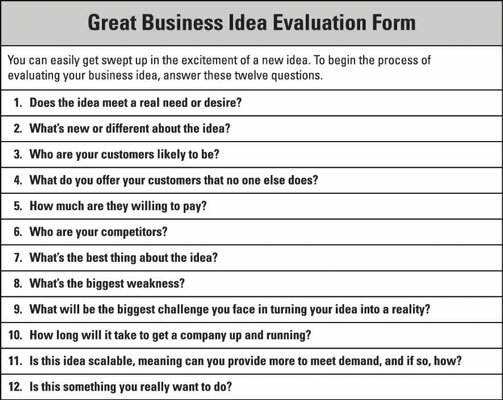 Read on to begin the process of evaluating your business idea to make sure it’s both realistic and practical. Plenty of successful businesses owe their success to a personal passion. A baker who starts a successful bakery, a musician who opens a recording studio, a teacher who starts a nonprofit tutoring service all have passion in common. That’s great. Excitement and confidence are crucial to making a business a success. But so is a good dose of reality. Personal passion can carry you away, blinding you to the hard realities that any business faces in making it in today’s highly competitive world. If you’re hoping to turn a personal passion into a successful business, you need to ask yourself a simple question: Can it make a profit? The question may be simple. Answering it isn’t always easy. If you’re sitting down to write a business plan because you have a great idea, now’s the good time to give it a test run. 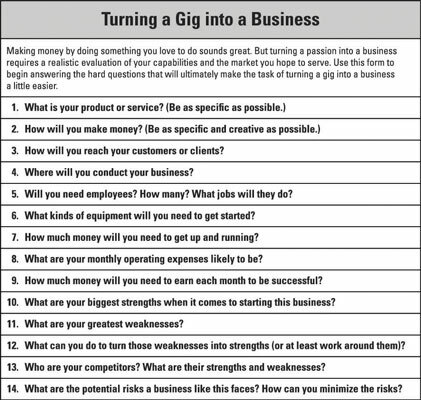 Use these questions to begin to evaluate whether the idea you’re excited about can turn a profit. Most successful entrepreneurs will tell you that they were surprised to discover what goes into making a business work. Often, the surprise is how little they knew about the nuts and bolts of operating a business. Consider the example of a woman who developed her baking skills at home and then started a highly successful northern California bakery. She knew the craft of baking. She knew the equipment she needed to go from home baking to commercial baking. What she wasn’t prepared for was managing a staff. In the first year, personnel problems plagued her bakery and almost scuttled her business. If you’re thinking of turning something you love to do into a business, take time to ask yourself some basic but important questions. This was completed by an electronics geek who loves tinkering and hopes to start a one-person repair shop and get a sense of what he would need to plan a successful business. Most businesses –– even those built on a great idea fueled by passion –– take time to become successful. A musician who decides to go professional needs to find gigs. An accountant who decides to leave her company and start her own business needs to set up and office and line up clients. An inventor with the next big thing needs to arrange for manufacturing and marketing. They all take time. The more realistic you are about how much time you’ll need, the better prepared you’ll be. Create a timeline for your proposed business. Even in the early stages of evaluating a business idea, a timeline tells you what you need to accomplish and when to be successful. Looking ahead obviously requires a fair amount of guesswork. Be as realistic as possible about when you’ll be able to reach each one. The saying goes that there’s nothing new under the sun. It also applies to most new businesses. Chances are a similar business to the one you’re planning to launch already exists. One easy way to test your new idea is to check out how other people doing roughly the same thing are faring. Check websites for information about products and services, including pricing. If appropriate, review online customer reviews of your competitors, which can provide invaluable tips on how you can do better. Search the web for business articles about the kind of business you’re planning. Be sure to check publication dates, because business reports can go quickly out of date. If you don’t find what you need online, make a beeline to your local library to browse the periodical shelves. Investigate how similar businesses market their goods or services. If you’re starting a local business, check out the Yellow Pages and local newspapers. Check out the competition’s online presence. If you’re going after a national or international market, analyze out how other companies use major media and their own websites to market themselves. Check out the local Chamber of Commerce. Most cities and even small towns have Chambers of Commerce, and almost all have websites. If you don’t find what you need there, make a visit to the bricks-and-mortar office to talk to a representative. Talk to prospective customers. If you’re starting a local business, ask friends and family what they consider important as prospective customers. If you’re planning a retail business, visit similar stores and observe how customers move through the aisles and what they buy. No matter what kind of business you’re planning, check out websites for customer reviews, which have become an invaluable way of listening to customers. 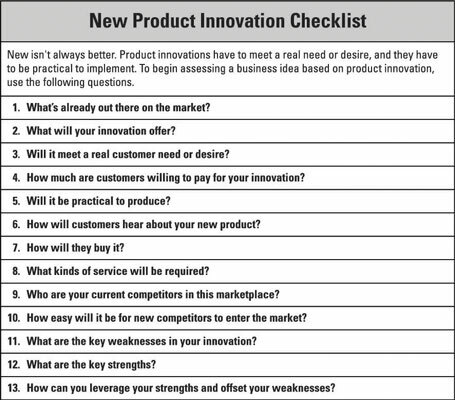 If your new idea is product-based, your business will face special challenges, such as who will make and distribute the product and what kind of service will it require.